But It’s My Favorite Umbrella…. May 21, 2012 May 20, 2012 Categories FaithChristian, Florida, God, Help others, Holy Spirit, Jesus, Led by the Spirit, Listen, Lord, obedience, Rain, Umbrella, Voice6 Comments on But It’s My Favorite Umbrella…. I never, ever have an umbrella when I need it. I mean EVER. I live in Florida where it rains nearly every day and I’m never prepared. I’m always fussing at myself for this lack of preparation, knowing that’s totally against my personal code of conduct. It’s an outright abomination. So, a few weeks back I specifically went shopping for umbrellas. Yes, more than one. I figured I’d probably forget one at home and one in the car so I’d better get a small one for my purse too. I resolved never to grab for a scarf or grocery bag again. A few days later I was leaving my office on a particularly rainy afternoon. I was feeling rather smug over the fact that not only did I have an umbrella, but it was cute and polka dotted. AND it even matched my outfit. So I sang a little song in my head, pretended I was starring in an old movie and pranced to the car. Then I looked to the right. At the bus stop sat a lady in the pouring rain with at least twenty bags of groceries. That was when God spoke to me. Wait. God didn’t really just say that. I’m dreaming. Keep walking and pretend you heard nothing, I thought. But I heard it again. And again. Each time I came up with a really good argument. But Father, it matches my outfit. Its polka dotted. It fits in my purse. Can I give her the ugly umbrella in the car? It’s bigger. It will work better. I pondered a few more minutes. I wrestled with the idea a few more times. Then I knew what I had to do. She smiled and thanked me as I offered her my umbrella. I said “God bless you” and she asked if she could keep it. I thought that was especially poignant. As I left the parking lot, I felt a sense of peace that I couldn’t describe. Blessing someone else felt great! I thanked the Lord for using me. Yet, I must admit as I walked up to her, I was somewhat expecting a loud clap of thunder, an orchestra to suddenly appear or perhaps Jesus Himself to descend on the clouds to tell me what a good thing I’d done. Hey… It was a really cute, polka dotted, purse-size, outfit-matching umbrella. Needless to say none of that happened, but what did happen is God showed me an important lesson in obedience. Deuteronomy 28: 1-3 promises blessings for those who follow the voice of God and how He leads. God wants to bless us and sometimes we need to learn to be obedient in the little things first. Then, He can give us bigger things. If we learn to hear His voice, follow His instructions, trust Him to lead us, then our heavenly Father can give us bigger and bigger things to do. As a parent, that lesson makes perfect sense and yet there are times when I still don’t think I get it. I’m learning though and that umbrella incident taught me to trust God a little more and I thanked him for his patience and love. 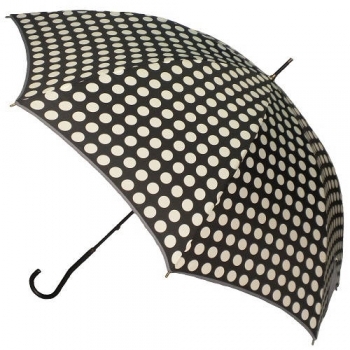 Then I went straight to the store and bought another cute, purse-size, polka dotted umbrella. I actually bought two, just in case! Next Post Paper, Plastic or Jesus? That is the greatest compliment you could give me on this blog! I love that you can hear me saying this. Thank you! Hello from another cape wearing mom. My blog is NotWonderWoman.com. I found you via Daphne’s blog, by the way. Love your umbrella story. It reminds me so much of Rees Howells’s biography that I’m reading now. That’s fabulous! I’ll have to check out your blog. Small world!